The Vertem Futurity Trophy is the final Group 1 race of the British Flat racing season. Open to two-year-old thoroughbred colts and fillies – the latter receive a 3lb weight allowance – but not geldings, the race is run over a straight mile at Doncaster Racecourse, a.k.a. Town Moor, and is staged annually in October. Inaugurated, as the Timeform Gold Cup, in 1961, the juvenile feature was subsequently run as the Observer Gold Cup, the William Hill Futurity and the Racing Post Trophy before Vertem Stockbrokers took over sponsorship in 2018. The 2018 renewal was worth £131,000 to the winner, with a total purse of £200,000. 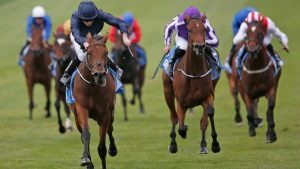 The outcome of the Vertem Futurity Trophy almost invariably has an effect on the betting for the Derby the following year; at the time of writing, the 2018 winner, Magna Grecia, trained by Aidan O’Brien, is quoted at 20/1 joint second favourite for the 2019 renewal of the Epsom Classic. All in all, five horses have completed the Vertem Futurity Trophy – Derby double. The first of them, Reference Point, was the sixth of 10 winners of the Vertem Futurity Stakes for the late Sir Henry Cecil – who remains the most successful trainer in the history of the race – in 1986 and, as a three-year-old, won not only the Derby, but also the Dante, King George, Great Voltigeur and St. Leger. The last of them, Camelot, was similarly the sixth of nine winners of the Vertem Futurity Stakes for Aidan O’Brien in 2012 and, having won the 2,000 Guineas and the Derby, came within 1½ lengths of becoming the first horse since Nijinsky, in 1970, to win the Triple Crown. In between times, the other three horses to complete the Vertem Futurity Trophy – Derby double were High Chaparral, also trained by Aidan O’Brien, in 2001/02, Motivator, trained by Michael Bell, in 2004/05 and Authorized, trained by Peter Chapple-Hyam, in 2006/07.